➡ HV High Voltage Cable Lugs 11kV 33kV – complete range of copper cable crimp lugs for the cable termination and connection of 16-1000sqmm circular stranded copper conductors in medium/high voltage switchgear, control panels, transformers and junction boxes. Manufactured by Cembre for use up to 36kV according to British Standard BS EN61238-1:2003 from copper tube material to EN 12735 with a high-conductivity and purity greater than 99.5% – typically used to terminate copper conductors to BS EN 60228:2005 Class 2. Cembre 2A cable lugs are manufactured from high purity copper tube – Cembre 2A cable lugs are rated up to 33kV provided Cembre die sets (ME Hexagonal type) are used and the cable lugs are installed using suitably calibrated Cembre crimping tools. Cembre 2A cable lugs feature a double length copper tube barrel for enhanced electrical conductivity and mechanical performance in high voltage cable terminations. The absence of an inspection hole prevents the entry of water or moisture into the crimped cable connection – Cembre 2A cable lugs are therefore suitable for both indoor and outdoor cable termination connections. 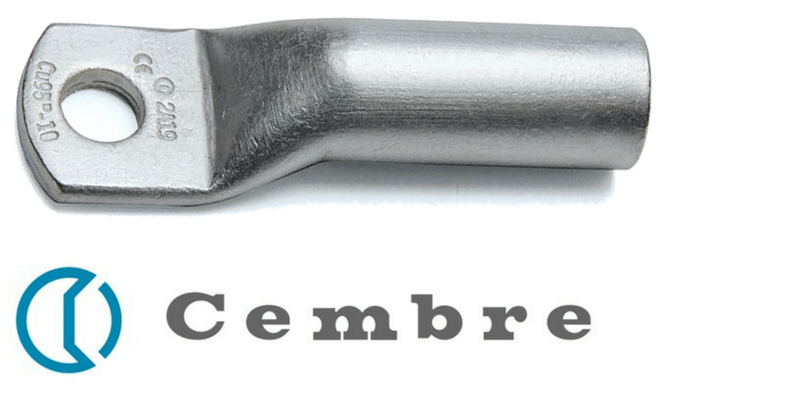 Cembre 2A cable lugs are electrolytically tin plated to prevent atmospheric corrosion – the lugs are available to suit stranded copper conductors 16sqmm-1000sqmm with optional stud holes including M8, M10, M12, M14, M16 and M20 depending on the conductor size. The Cembre range of cable lugs are also suitable for terminating array circuit bonding cable connectors and VT circuit bonding on high voltage power cable networks on offshore substation and wind farm projects. Cembre 2A range of cable lugs feature a double length conductor barrel for improved electrical and mechanical performance on high voltage cables and circuits – compatible for use with cold shrink, heat shrink and push-on type high voltage cable terminations. ➡ See complete range of HV Cable Lugs.